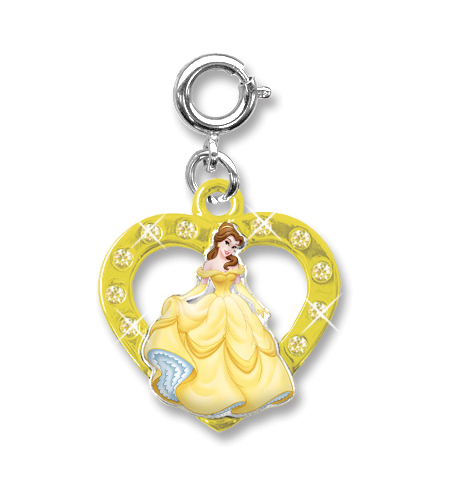 Belle, from Disney's Beauty and the Beast, has a heart of gold and a compassionate spirit and this CHARM IT! 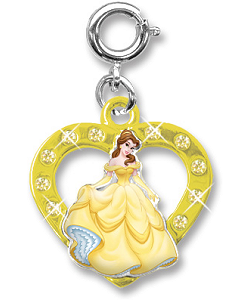 Belle Heart Charm is sure to show this fun Disney spirit in you. Sparkly clear acrylic stones around the yellow heart surround a raised Belle creating a 3-dimensional effect in this Belle heart charm. With a simple snap of a clasp, girls can personalize their CHARM IT! jewelry with this CHARM IT! Belle Heart charm. This CHARM IT! Aurora (Sleeping Beauty) heart charm is perfect for showing your Disney spirit. This CHARM IT! Cinderella heart charm is perfect for showing your spirit of sweetness and grace. This CHARM IT! Snow White heart charm is perfect for showing your spirit of caring and kindness. This adorable Tinker Bell charm from the CHARM IT! Disney collection features colorful enamel and glittery wings. This beautiful Frozen Elsa and Anna Heart Locket charm features Elsa and Anna surrounded by magical snowflakes. Don't worry, be happy…girls will be all smiles with this rainbow smiley face charm bracelet. The fun wall decals in this Disney Princess Magical Garden Decorating Kit include Cinderella, Snow White, Belle, Sleeping Beauty, and accents.